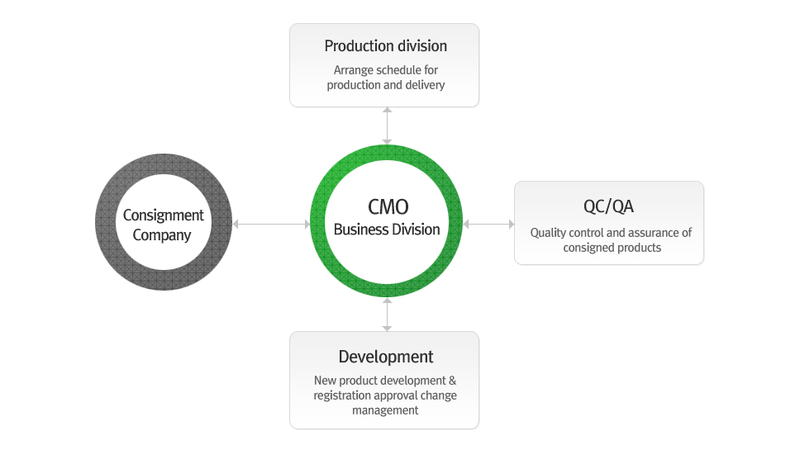 The CMO provides documents necessary for registration approval and post-management of consigned products so as to provide high-quality service on consignment by producing and delivering high-quality products on time. Due to excellent automatic production facilities and know-how of our professional employees, we produce high-quality drugs through strict process management. Through regular validation, we do our best to manage the product quality and production facilities. We are dedicated to producing and documenting data from product test results and accordingly maintain quality assurance. We supply our products on time due to sufficient capacity and flexible production schedules. We provide standard documents according to our client’s product release schedule. We maintain cooperative systems among divisions such as the CMO business Div., Production Div., QC Div. and QA Div. We provide various data and documents immediately upon our client’s request.